When I was a kid, I used to dissect my egg rolls. I’d cut open the outer shell, carefully remove the inner contents and then devour my favorite part – the crisp, oily wrapper. Then I’d mix the filling with some duck sauce and spoon that up as well. I don’t know why I started doing it that way, but it always seemed to make eating them more fun. When I was diagnosed with Meniere’s Disease, I thought I’d have to give up egg rolls forever. But it wasn’t long before a craving for them put me to work. These have the same crisp skin I used to love, with a filling redolent of ginger. Your house will smell divine after making them, but eating them is still the best part. In a small saucepan, combine all of the ingredients for the faux soy sauce. Heat over low for several minutes, stirring frequently. Remove from heat and set aside. Heat oil in a large saute pan over medium-high. Add all of the filling ingredients and cook, stirring, 2 minutes. Remove from heat. Beat egg and tablespoon of water in a small bowl; set aside. 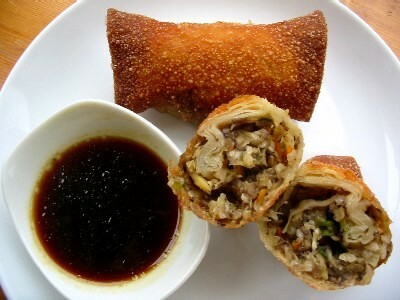 To assemble the egg rolls, lay a wrapper flat in front of you on a clean surface. Rotate the wrapper so that the points stick up and down (like a diamond, rather than a square). Place 2-3 T. filling on the surface, just below the middle of the wrapper. Fold the bottom point up, so that it covers the lump of filling. Fold each of the side points over, so that they cover the lump as well (the wrap will look a little like a folded napkin). Roll the wrapper away from you once, so the filling is now neatly sandwiched inside. Lightly brush the exposed top point with the egg mixture and roll the wrap away from you once more to seal. Repeat procedure with remaining wrappers and filling. DO NOT OVERFILL. Deep fry 2 or 3 egg rolls at a time until deep golden brown, about 5 minutes. Remove from oil and drain on paper towels. Serve hot with remaining faux soy sauce on the side for dipping. This entry was posted in Side Dishes, Snacks. Bookmark the permalink. I’m a bit confused. How can these be about 30mg per egg roll when the wrappers are about 150 to 180 mg each (depending upon where you look)? I just saw your soy sauce you listed for this recipe… it brought a tear to my eye (seriously!). I haven’t tried it yet, but we love Chinese food and I just assumed that part of food was over when I got the Ménière’s diagnosis. Thank you!! I can’t wait to try this and sooo many of your recipes!!! Hi Christi! So glad you found the site! Really hope you’re feeling well and enjoying some of the recipes!